Summary and Definition: The semi-nomadic Spokane tribe were fishers, hunter-gatherers and traders of the Plateau cultural group who mainly lived by the Spokane River and in the west by the Columbia River on the Columbia River Plateau. The picture, by artist Paul Kane, was painted in 1847 and depicts the Scalp Dance by Spokane Native Indians. What language did the Spokane tribe speak? The Spokane tribe spoke in a Salishan dialect similar, the language use by the Northwest Pacific coastal tribes. The meaning of their name was "children of the sun". The tribe consisted of three bands known as the Upper, Middle and Lower Spokane Indians. What was the lifestyle and culture of the Spokane tribe? The Spokane were influenced by the coastal tribes and many built villages of plankhouses. Others built pithouses as their winter shelter. Their summer shelters suited their nomadic style and they lived in tule-mat lodges that were fast to erect and easy to dismantle. After the introduction of the horse in the 1750's the Spokane people of the Plateau region traveled to the Great Plains to hunt buffalo and adopted the some of the lifestyle elements of this cultural group, including the tepee and similar clothing made from buffalo hides. Who were the allies and enemies of the Spokane tribe? The allies of the Spokane tribe were many of the other Native American Indians who inhabited the Plateau region including the Cayuse, Walla Walla, Coeur D'Alene, Palouse and the Nez Perce. The main enemies of the Spokane tribe were the Great Basin groups to the south, including the Shoshone, Blackfeet, Northern Paiute, and the Bannock tribes. Where did the Spokane tribe live? The Spokane are people of the Plateau Native American cultural group. The location of their tribal homelands was in modern day Washington, the tribe controlled additional territory in Idaho and Montana The geography of the region in which they lived dictated the lifestyle and culture of the tribe. The picture of the Spokane scalp dance was performed in a Spokane village near Kettle Falls on the Columbia River. It depicts the central figure of a Spokane woman, whose husband had been killed by a Blackfoot Native Indian. The stick she waves has a Blackfoot scalp on top of it. The woman whirled around a fire flailing the scalp and kicking in revenge. Behind her, eight attendant painted women danced and chanted, as did the rest of the tribe, to the beat of drums. 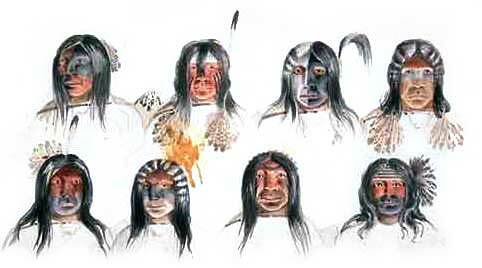 The painted faces of the Spokane women are taken from the Scalp Dance picture. The white paint worn by the women symbolized mourning and the black paint, a very aggressive color, symbolized strength, and in this instance, also symbolized power, revenge and striking terror in any onlookers or captives. Chalk deposits were plentiful and charcoal was easy to make resulting in distinctive white and black face painting. Lewis and Clark encountered the Spokane tribe in October 1805. The tribe heard about the Lewis and Clark expedition and sent two runners to meet them as the Corps of Discovery approached the Columbia River. Additional encounters with the Spokane were made at the Long Narrows of the Columbia at their ancient Wishram village and witnessed the tribe trading and enjoying leisure activities such as wrestling and horse riding. What transportation did the Spokane use? The Spokane tribe used canoes made of strong and water-resistant birch bark that could be easily bent, cut and sewn. Th birch bark canoes were important for their way of life. The Spokane hollowed logs with fire and then bark was stretched over a strong, lightweight, wooden frame to make a bark canoe that could be easily steered. The canoe was perfect means of transportation for travel along fast streams and shallow waters of the Columbia River. What food did the Spokane tribe eat? The food of the Spokane tribe included salmon and trout and a variety of meats from the animals and birds they hunted. They supplemented their protein diet with roots, seeds, nuts and fruits. What weapons did the Spokane use? The weapons used were spears, lances, clubs, knives and bows and arrows. The Spokane also used shields for defensive purposes. What clothes did the Spokane wear? The following Spokane history timeline details facts, dates and famous landmarks and battles fought by the Spokane Nation. The history timeline explains what happened to the people of their tribe. 1805: The Lewis and Clark expedition met the tribe on their travels along the Columbia river. 1825: The sons of Spokane Indian leaders are sent to the Red River mission school by the Hudson's Bay Company. 1855: The Yakima War (1855-1858) erupted, fought by members of the Native Indian alliance including the Spokane, Cayuse, Walla Walla, Umatilla, and Nez Perce tribes. 1881: The Lower Spokane moved onto the newly formed Spokane Reservation.